The player ratings for the Indian players against New Zealand in the 1st T20I is out! 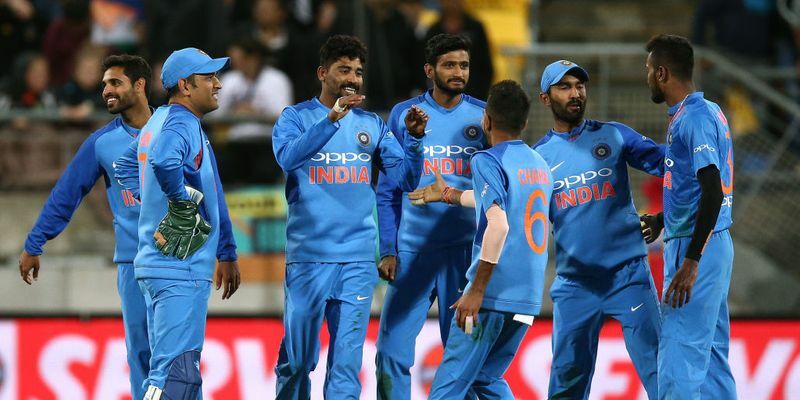 After a Tim Seifert special guided New Zealand to 219, their bowlers handed India an 80-run loss - their biggest Twenty20I defeat - to go 1-0 up in the series. While Vijay Shankar and MS Dhoni were impressive for India, others failed to match the Kiwis’ standards and contributed in the loss. Rohit Sharma (3/10): It was one of those days when the stand-in Indian skipper was clueless in every department. He couldn’t contribute with the bat, and his bowling change as a skipper was never on point. While throwing the ball to Vijay Shankar was the perfect option, he gave the ball to Bhuvneshwar Kumar who was clearly struggling with his rhythm. Could have been better with his approach. Shikhar Dhawan (7.5/10): The left-handed opener was watchful against Tim Southee due to his history with the bowler, but he managed to score some easy runs against Scott Kuggeleijn and Lockie Ferguson. However, he was done by the sheer pace of a Ferguson yorker when India needed him to fire in all cylinders. However, the other school of thought could be that he scored runs at a good strike rate which gave the middle-order a chance to build on that and that forces me to go slightly above than what I initially thought to give. Vijay Shankar (8/10): The promotion of Vijay Shankar up in the order meant only one thing, that he is a prime contender for a spot in the World Cup team. He did just enough to repay the trust by scoring a quick-fire 27 and looked well on the course to score a big one today. He was miscuing a bit towards the end but looked confident throughout. Rishabh Pant (4/10): It is just surprising that Pant, for all his big-hitting ability, is yet to prove himself in the T20I format. It might have something to do with his over ambitiousness, and that was exactly on the show today as he failed to guide any of the short balls dished out to him. Mitchell Santner dismissed him with a full ball, and the problematic part is he failed to figure that out. Needs to better his judgment, and he is very much capable of doing it. MS Dhoni (wk) (7.5/10): The MS juggernaut rolls on. After few excellent ODI innings, Dhoni made a fine 39 in the T20 to make sure that he is battle ready for the World Cup. He started slow, like he always does, and then put his foot on the sixth gear to score at a strike rate of 125.81. His boundary hitting through the bottom-handed shots, which had been his weapon in his heyday, was unleashed without any problem and that would be the biggest takeaway for him from the game. But the margin would have been lot lesser had he tried to play like that a bit earlier today. Dinesh Karthik (3/10): It was a day that Dinesh Karthik would do well to forget. He took a brilliant catch, but he dropped a couple more - one offHardik Pandya and the other off Krunal Pandya - to hand New Zealand the advantage in the middle overs. With the bat in hand, he failed to deliver as well, making himself the main contender for the “Worst player of the match” award, if ever there was one. Hardik Pandya (3/10): The law of averages caught Hardik very soon, only the problem was it happened too quickly for anyone's liking. After an excellent return in the ODI series, the all-rounder conceded runs at 13 per over and only managed to score four runs. He was needed to give MS Dhoni the support in the middle-over, and his dismissal proved to be the last nail in the coffin for the visiting team. Krunal Pandya (7.5/10): The senior Pandya underlines the value that he brings to the table in the shortest version of the game - both with the bat and ball. Sure enough, he picked up only one wicket, but it could have been three had Karthik managed to gobble that up and Tim Seifert didn’t hold his stance. However, that was all part of the game, and there was a chance for him to redeem himself, which he did by scoring 20. Could have done more, but cut him some slack now. Bhuvneshwar Kumar (4/10): It was surprising to see Bhuvneshwar Kumar to see the way he bowled today. His lengths were off and he was bowling like he just had to finish the overs. There was no penetration whatsoever - something that was not the case in the ODI series. Is it a matter of continuous cricket after injury rehabilitation? Maybe. Yuzvendra Chahal (7/10): The leg-spinner conceded runs at 8.75 runs per over, which is not bad considering a leggie was bound to go for runs in a small stadium like Westpac. But the problem was after his first over, he resorted to bowling with a 6-3 fieldset to contain runs instead of picking wickets. In Kuldeep Yadav’s absence, he was supposed to be the wrecker in chief, but unfortunately for India, he couldn’t. Khaleel Ahmed (4/10): The more he is playing, it is becoming more apparent that he has been fast-tracked. Khaleel was a bowler touted for his ability to move the ball both ways, but he is not doing that at all. Moreover, his reliance on those odd errors by the batsmen meant the pacer has been found out way too soon. Today, Colin Munro understood that from the word go and launched him on the off-side with absolute disdain.